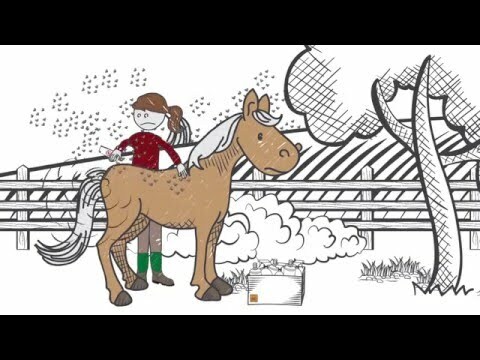 Ecovet™ introduces a less toxic approach to pest control for your horse. Tested and endorsed by veterinarians, Ecovet™ is designed with a proprietary mixture of food-grade fatty acids and silicone oil to effectively repel many types of flies, ticks, mosquitoes, and lice. 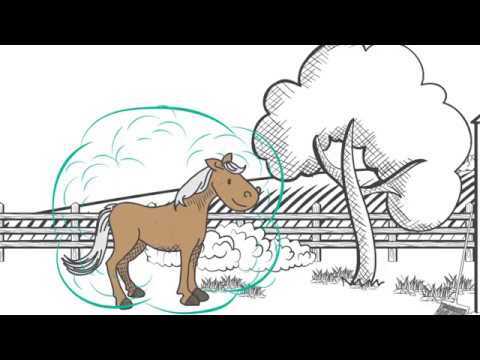 It works by forming a natural barrier around horses to repel those annoying pests. The proprietary mixture confuses and overwhelms an insect's normal directional ability so the insect is unable to locate your horse. I love this stuff it is awesome!! Ecovet works well. I apply by spraying a rag and wiping on. This repellent seems to last a while and work well. What I don’t like about it is that I have to walk my horse while I spray him because it forms a heavy cloud that makes us both cough quite a bit. This spray was interesting, and hard for me to rate because it seems that everyone has a different experience. I put it on my sensitive TB before I rode outside on a hot day. Here is my total experience with it:The smell is potent; not awful, but smelled strongly like concentrated saddle soap. Definitely lingers, but didn't seem to bother my horse.It kept the flies off for awhile, but after about 20 Minutes it was like some weird signal went off and all of a sudden the green heads were attacking us. Only us, the other horses were fine, though they used a different fly spray. My horse kinda freaks out about the bigger bugs, so I had to take him back to the indoor. When I got back he seemed really irritable, and he had some small raised bumps on his skin in the areas I sprayed. I washed him off, and haven't used the product since. It could really work for other horses, it just might be the way the spray reacts with my horse's particular chemistry. 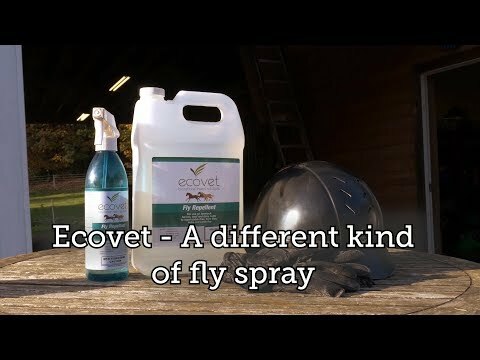 EcoVet is our go to fly spray every year. It is costly but well worth it for control of mosquitoes, gnats and deer flies. I like a natural products. Love Ecovet. By far the best fly spray that we have used. The scent is strong and I prefered the original scent. The new scent spells like a citronella candle. I will continue to use it because it works so well. This stuff really does work, but it has a very strong smell. Spray in well vented area! One of my Morgan's has sweet itch, meaning he has an allergic reaction to the tiny gnats (no-see-ums?) that bite his belly when he is turned out. I used to have to put Vaseline on his belly to deter them and give him relief which was a mess. Since I started spraying this on his belly and mane, he has grown a long full mane and tail and never gets down and rubs his belly on the ground or bites his belly. It is incredible. Fly sprays are just that, for flies. I've never found one that works on the tiny biting bugs, but this product does. Good value - less poisonous! Nothing ever seems to keep all the flies away, but this product does it as well as any others I've used - and it does so with what appears to be a lack of chemicals toxic to horse or human, which is a tremendous plus. And although seemingly pricey per oz,, it goes a great deal further than any other product I've used, because much less is necessary to achieve basic protection. Hence, all round, a pretty good deal and a good product. I got tired of spending money and polluting the horse and myself every season. I live in TN and last year we did not have a freeze, so that means flies galore. I went to the dover store and they suggested we try this. This spray is the best ever and last through a thunderstorm and pouring rain too. Works very well on gnats and mosquitoes, not so much with black flies. Central Florida area. I was hesitant to spend this much on a small bottle, but my horse goes berserk on the trail when buzzed and bitten by flies. The first time I used it even the swarming horseflies stayed (mostly) away. Since I don't have to cover the horse in the spray (just a few squirts in strategic places, I don't need as much as with a regular fly spray. It did wear off slightly by the end of our 2.5 hour, very sweaty ride. And it does have a funky smell. But all in all, this worked better than anything else I've ever tried--and I'll be buying a gallon of the stuff soon. No toxic chemicals and he kept his hair on! The only fly spray that has ever worked on my extremely allergic horse. He doesn't rub his hair off any more! With 2 horses allergic to pyrithrins/permethrin, this looked like something worth trying. The best fly spray I have found for my sensitive Appy Pony. Friends recommendation-though no fly spray works well! It works and I want to try the new scent. This fly spray really does work so I'm trying out the 'new scent' for 2018. The old scent was pretty awful and made me sneeze no matter how careful I was with application. Reviews I had read made it sound better than the fly sprays I could find locally. And it works REALLY well on the trail. Giving this a try, because I am still looking for something that works well for Louisiana bugs! This is the only thing that keeps away the small biting black flies that bother my horse all spring and summer. Works great on my alpacas! I have been trying a variety of fly sprays without a lot of success. This one was reviewed well and I like that it is less toxic. I'm hoping this new method of bug repellent is healthier for the horse and me and works better to prevent ticks from being attracted to my horse. This is the ONLY fly spray I've found that works on my sensitive OTTBs! Saw on internet and want to try. Can people use this product on themselves? BEST ANSWER: Hello, I am not sure weather this product is intended on being used on people. But if you do choose to, it shouldnâ€™t be harmful, but it could potentially cause an allergic reaction if you happen to be allergic to the product. BEST ANSWER: No, not necessarily. But if they roll after application, it would need to be reapplied. Product says it last for 2 days but not if they roll. I asked the manufacturer about that. It does deter the flies but the smell is not for me. Very strong scent which I cannot tolerate and my horse snorts after using it. It does work! I m not sure for I always brush before I spray the Ecovet fly spray on. It doesnt smell the best , but it works great and my horse has sensitive skin, so I always use precaution when buying fly repellent. It does a great job with keeping off the bugs. The cleaner the better. Otherwise the spray sticks to the dirtâ€”which can fall offâ€”rather than the horse. If the sp ay is on the dirt rather than the hair, thereâ€™s less protection. No, it isnâ€™t necessary that they be clean. It has a strong odor that they donâ€™t seem to like. They seem to roll right after application, Iâ€™m assuming to get rid of the smell. The manufacturer recommends that the horse be clean and dry. I found that it doesn't make a big difference about the dirt, except it won't last as long. It is best if they are not covered in mud that has dried, but dirt and sand are not an issue for my horses when I use Ecovet. Our horses are kept outside with a run-in shed and also roll around in the sand/dirt; this spray still works pretty well. Works great and your horse does not need to be clean. What about all the warnings on the labels not to get it on skin or clothes or in the eyes? I thought this was supposed to be an eco-friendly spray but it sounds like if I get it on my hands that's going to be a problem because all the sprayer seem to drip. It doesn't bother us. Only the smell is strong, makes my horse blow his nose for awhile. Otherwise it works well for flies. it is not a problem if you get it on your hands. The warnings are common sense. They have to say that.